Detailed review of Radha Beauty Rosehip Oil. See what real experts and actual users have to say about this face serum. Switching it up from the normal face serum I review, I decided to trial Radha Beauty Rosehip Oil. Instead of applying it to your skin first, you apply the oil to your face as the final step of your skincare routine, making this a much different product than I’ve tried before. While the application was super easy, it was missing some of the components you expect from rosehip oil, including the delicious smell and anti-aging results it promises. On the flip side, however, this facial oil is extremely affordable and delivers an intense amount of hydration to your face, and even your chest! If your skin is dry and looking for some added moisture, and especially if you’re on a budget, Radha Beauty Rosehip Oil is definitely a product to give a chance! However, if you’re looking to decrease fine lines and wrinkles, or address other anti-aging concerns, this isn’t the facial oil for you. Radha Beauty Rosehip Oil has the exact texture you would expect from a facial oil—super thin and oily (Duh). Once you apply the oil to your face, it’s pretty comfortable to wear. As you’ll read in the application section below, this isn’t something you layer products on top of, so it just feels like an oil resting on top of your other skincare products. The application of Radha Beauty Rosehip Oil is super easy! They actually didn’t provide many instructions on the packaging, so a lot of how I used it was based on how I’ve used other facial oils in the past. Unlike a face serum, I actually applied the rosehip oil last in my skincare routine. So I washed my face, and used all of my other products first. Then I applied 3 drops onto my fingertips, and applied it evenly to my face. I also opted to use some on my neck and chest, which I loved! I just made sure to use only three drops for that entire area too because I didn’t want to get any oil on my pajamas and sheets. I only used the oil at night, as well. I can’t apply any face products on top of a facial oil, let alone makeup. And I don’t want to walk through my day with an oily face…so I only used this at night! There isn’t really a dry time for Radha Beauty Rosehip Oil. Since it’s a facial oil, and you apply it on top of your other products, your face stays oily for a long time. I only used this oil at night, and while it was absorbed by the time I woke up, it wasn’t by the time I went to bed, which was about 60-90 minutes after I had applied it. So there really isn’t a dry time. I’m so bummed at the lack of smell for this oil! I’ve used a few other Rosehip Oils, and I absolutely love the smell. Rose is such a delicious, high-end smell, and I personally love that lingering scent that most of these products have. Weirdly enough, Radha Beauty Rosehip Oil doesn’t have any smell—rose or otherwise. I guess that’s a pro for anyone sensitive to smells, or anyone who dislikes the rose scent, but I really missed that with this product. Since this is a facial oil, which I only use at night, I used Radha Beauty Rosehip Oil before bed first. I didn’t have any initial thoughts when using the product, but it was super easy to apply! When I woke up the next morning, I noticed my skin felt much more hydrated than it normally does. It actually got rid of some of the dry skin I was experiencing from the last face serum I trialed. Since I had also applied the oil to my chest, I noticed that I had way less lines on my chest from sleeping, which I thought was awesome! Definitely not trying to get wrinkles on my chest from sleeping on my side, and I think this would help with that! I’ve used other rosehip oils before, and as far as the long-term results are concerned, Radha Beauty Rosehip Oil is just okay compared to others. I found that my skin was very hydrated and plump from using it, which is awesome! I also found that brightened up my complexion quite a bit, which is something I’m always looking for with a facial oil. However, other rosehip oils I’ve used have done a better job at brightening my complexion. The facial oil also promised to deliver anti-aging results such as decreasing fine lines and wrinkles, and it definitely didn’t do that. My skin looked identical in that department, as well as with dark spots and skin complexion, which was a bit of a bummer. Radha Beauty Rosehip Oil is definitely worth the money! I can’t believe how much product you get for less than $16, and since you only use a few drops every day, this will last you a couple of years (not exaggerating). It does add a lot of hydration to your skin, and brightens up your skin tone a little, so for that reason, I do think it’s worth your money! I do think there are better rosehip oils on the market, especially when it comes to the results they deliver, but they definitely aren’t this affordable! And they also aren’t as hydrating as this facial oil is. Radha Beauty offers a 100% money-back guarantee on all products purchased within 90 days. They also allow you to keep the product versus going through the trouble of sending it back, so this is an awesome return policy! 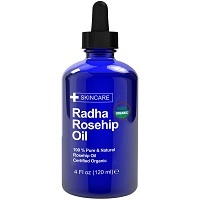 To purchase Radha Beauty Rosehip Oil, click here.